Engagement is your ability to connect with people right where they are—to relate, and to cause them to believe that you understand what they're going through, and that you have the answers. 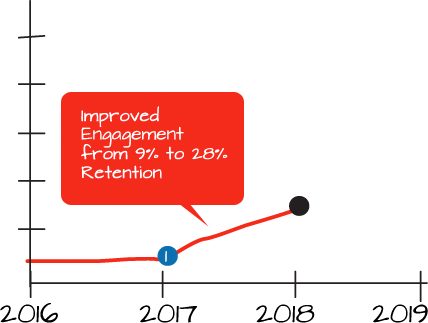 Engagement done well, keeps people coming back, and great engagement inspires those people to go deeper. Most organizations who lack the growth they desire often attibute the growth shortage to a lack of advertising or a poor brand, but engagement is all about the heart. Do you truly know who you're trying to reach? Do you truly know how to reach them right where they are? If you do it will be evident and growth will be natural. If you don't, well, that's evident, too. For us, it's an all out blitz—pulling together demographics and psychographics with organic field studies, and secret shopper analyses (of you and the competition)—helping you evaluate thorough proprietary analytics. All this to bring a giant mirror in the room so you fully understand where you are as an organization and understand where you need to improve in order to reach your goals. Because our approach is an all out blitz, it's not just a project to us. It's a service we provide, in relationship. It's the clarifying time, the 'aha!' moment, and the point at which you know you'll never go back to where you were. But now, armed with a greater understanding of who you are, you're ready to charge the mountain. Community "word on the street"
what effect does healthy engagement have? When you increase engagement, it increases retention and advocacy... more people share their experience with others and growth takes off.